Plaids, olive, burgundy, and navy’s are always fall favorites, and for me I’ve always loved mustards and tans! 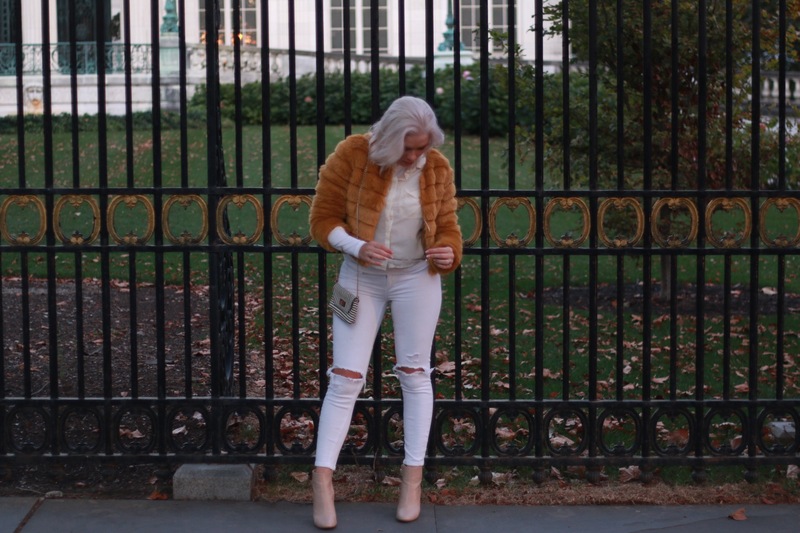 I’m so excited that mustard yellow is coming back this fall because I finally got to whip out my favorite faux fur! I am at 6 1/2 weeks postpartum now and no lie I can squeeze into 3 pairs of my pants, these white ones, a pair of black ones, and 1 pair of lightwash denim. It’s insane how much our bodies transform when we have children-no complaints here! I finally hit my weight goal, and got the approval to get into my workout routine! I’m slowly working these “winter white” jeans into my autumn attire. James took the day off and we spent an amazing day in Newport, while he snapped photos of me. I received this gorgeous gold cuff bracelet from Ona Chan Jewelry and I’m obsessed. Usually because my wrist is tiny I don’t really appreciate bracelets, but this fits like a glove! It’s called her “Dagger Cuff” and it comes in silver and gold. What I fell in love with when Ona contacted me was her ability to create pieces that represent her life. I completely relate to the concept of embracing moments and making something your own. That’s what I’ve aimed to display with creating my blog. The gold cuff went perfectly with my neutrals and mustard jacket. Ona has some great pieces, along with a collection ‘Mimi Too Collection’ which will help benefit the Boston Children’s Hospital. A huge thank you to Ona for sending me this piece! I know it will be a staple in this years wardrobe for me.